This Green Bean salad is one of my favorite veggie dishes. 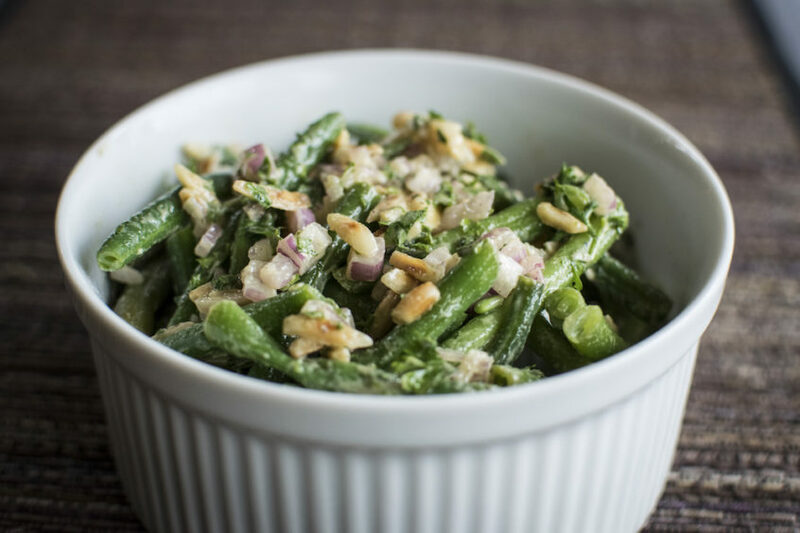 The green beans still have a crunch to them, you have the bite from the red onion, nutty almonds and this creamy tangy salty dressing that is fantastic! Wash and trim your green beans. Cut them in half, or bite-size pieces. Using a steamer of your choice, steam the beans for about 4 minutes, or until bright green and just cooked but still crunchy and not mushy. Let it drain. Toast the slivered almonds until golden brown and fragrant. Be careful not to burn them! Finely chop the shallot and parsley. In a large bowl, whisk together the olive oil, vinegar, and mustard until emulsified. Season to taste with salt and pepper. To the bowl, add the green beans, shallot, parsley, and almonds. Mix until everything is coated with the dressing. Serve warm, cold, or at room temperature. Enjoy! Yum. Thanks for your recipes Amber. I love the mustard vinaigrette. I really need all the help I can get!